If you like the look of bamboo shades (aka bamboo wood blinds) but don’t want to pay the high price tag for custom shades. Don’t worry! Cheap bamboo shades are available! You just have to know where to look. Cheap bamboo shades can be found at big box stores, and by looking online. Most big box stores carry a variety of sizes and colors of cheap bamboo shades. Just be aware before you go shopping that most are not able to be re-sized. So the bamboo shades you see on the shelf are what is available. You may have to opt for an outside mount instead of an inside one. It’s also worthwhile to stop by smaller stores as well, sometimes you can find a real bargain if you take the time to do some intense shopping. If you don’t have room for an outside mount check out the bamboo looking roller shades available at Home Depot. They are only available up to 60″ wide, but the store can cut them down for your size. Can’t find what you like at the big box stores? Look online. There are lots of websites available that advertise cheap bamboo shades. You’ll find many more colors and sizes available online. Just be aware of the return policy in case the color is not as you expected. Also keep in mind that once again you will probably not be able to find your exact size and an outside mount may be needed to make them work. Typically speaking you want a shade that the actual dimensions are 1/2″ smaller then the size of your window opening. 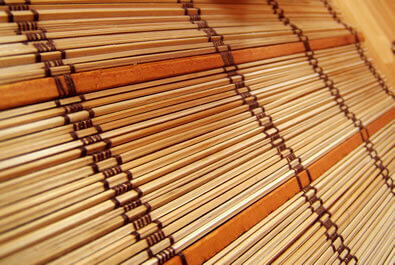 No matter whether you look at big box stores or online, cheap bamboo shades can be found if you know where to look! It just takes a tad bit of time and tenacity, to find the perfect blind.